(Central Islip, N.Y., June 6, 2006)  The Long Island Ducks, members of the Atlantic League of Professional Baseball, today announced that they have purchased the contract of pitcher Greg Modica from the Road Warriors for the 2006 season. He will join the team today for their series with the Lancaster Barnstormers. We are happy to fill the open slot in our rotation with Greg, says Ducks manager Don McCormack. He has had success in this league and we are confident that he will continue to have success with Long Island. Modica is in his sixth season of professional baseball and his third in the Atlantic League. The 26-year old enjoyed his finest season in 2004 with River City (Independent, Frontier) and Somerset (Atlantic). That year he owned a combined 13-3 record with a 3.00 ERA in 21 starts. In six starts this season with the Road Warriors, the native New Yorker was 1-1 with a 3.74 ERA while striking out 28 in 33.2 innings of work. In an additional roster move, the Ducks assigned outfielder Bryan Goelz to the Road Warriors. The Long Island Ducks are in their seventh season of play in the Atlantic League of Professional Baseball. They have averaged over 100 percent attendance capacity of 6,002-seat Citibank Park in each of their first six seasons and are one of the most successful minor league sports franchises in the country. For further information, visit www.liducks.com or call 631-940-DUCK. A Scout From The New York Mets Is Keeping A Close Eye On Former RGMVM LL Star Greg Modica. May 24, 2005 Radmanovich's error overshadows Modica's gem By GEOFF MOSHER Staff Writer BRIDGEWATER -- A scout from the New York Mets is keeping a close eye on Greg Modica. Copyright © 1997-2005 Courier News. If he ignores Modica's record and looks closer at the Somerset Patriots right-hander's mastery of Atlantic League hitters, Modica's next start could come in Binghamton, N.Y., the Mets' Double-A home. It's not Modica's fault that the Patriots fell 5-1 to Bridgeport on Monday night at Harbor Yard, a loss that snapped Somerset's season-high four-game winning streak and dropped Modica to 0-2. His only mistake, a 1-2 fastball left up to Michael Coleman that disappeared behind the left-field fence in the fifth inning, wouldn't have occurred had right fielder Ryan Radmanovich not misplayed a two-out fly ball. The error allowed Bluefish second baseman Angel Espada to score from second. Three batters later, Coleman added to his league lead when he crushed his seventh homer of the season. Not only were all four runs charged to Modica unearned, manager Sparky Lyle fumed over two calls by home plate umpire Dan Wilson that would have ended the fifth before Coleman could go deep. Other than that, Modica, 25, sparkled. It might be enough to secure a one-way ticket to the Mets' farm. Lyle said he told Mets scout Joe Nigro about Modica before his May 13 start against Atlantic City. "If he's going to take anyone, he's gotta take that kid," Lyle said. "Who's throwing harder than him? They're nuts if they don't pick this kid up." Modica shrugged off the notion that Monday's start might be his last in the Atlantic League. "I've been getting looked at the last three years, and nothing has happened," he said. "I don't worry about it. If anyone's interested, they're interested. If not, they're not. That's just the way I go about it." Lyle and pitching coach John Montefusco have helped Modica enhance his portfolio, convincing him to bring back a knuckleball he once abandoned to complement his change-up and curveball. Modica fanned a season-high eight batters and scattered just four hits in five innings. "I don't want to be labeled as a knuckleballer," Modica said. "I've got good enough stuff to get guys out. I don't need it, but I see how using it makes my other stuff better. I almost see it as a split-finger (fastball). I throw it in the same situations." Unfortunately for Modica, his counterpart for the second straight start had no trouble keeping the Patriots in check. Bluefish left-hander Luis Arroyo, who helped the Patriots win their first league title in 2001 as a situational left-hander, allowed two hits and struck out five in six innings for his first win. Not until Patriots shortstop Kevin Nicholson homered off Dan Krines to lead off the ninth did Somerset get on the score board. But the genesis of the Patriots' troubles began in the fifth, when Espada, the No. 9 hitter, popped a short one-out bunt toward the left side that third baseman Jeff Nettles dived for but couldn't reel in. Modica fanned Rolo Avila on a 1-2 breaking ball for the second out and nearly escaped the jam when Corey Hart smacked a harmless line drive to right. Radmanovich has played right field almost flawlessly this season but completely misjudged the ball and over-ran it. The ball dropped under his glove for an error that allowed Espada to score from second. "I don't know what happened," Radmanovich said. "I messed it up. I just basically screwed it up." D.J. Boston then drew a full-count walk to put two on for Coleman, a familiar foe.Coleman took Patriots reliever Shane Heams deep on an 0-2 fastball in the eighth last Wednesday, breaking a 1-1 tie in a 6-1 Bridgeport victory. This time, Modica left a 1-2 fastball up and over the plate and Coleman rocketed the pitch over the left-field fence for a three-run shot and 4-0 lead. "I wanted to get it away," Modica said. "Every time I throw it away, he hits it off the end of the bat. He hasn't put a good swing on a fastball yet for me. If I get that pitch away, he hits it off the end of the bat like he always does. I bailed him out." Actually, Lyle credited Wilson for bailing out the Bluefish. He said Modica's payoff pitch to Boston and 0-2 offering to Coleman should have been called strikes. "It's a darn shame," Lyle grumbled. "He had both guys struck out and didn't get it. I'm sick of it (bad umpiring)." Former Ridgewood, Glendale, Middle Village, Maspeth Little League and King baseball fire-thrower Greg Modica has signed a Rookie A contract with the National League San Diego Padres. Click The Link Above For The Full Story. In The Coming Weeks We Will Add More RGMVM League Alumni... So Check Back Often !! The Somerset Patriots have announced the re-signing of right-handed pitcher Greg Modica. 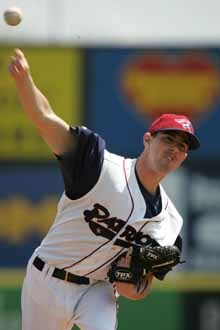 Modica finished the 2004 season with the Somerset Patriots, starting two games at the end of the season. Modica was 2-0 with a 0.75 ERA and 15 strikeouts in 12 innings pitched for Somerset. Modica began the 2004 season with the River City Rascals of the Frontier League, starting 19 games and posting an 11-3 record over 129.1 innings pitched. The Glendale, NY, native also struck out 91 batters. Modica has two years of experience in the San Diego Padres organization and spent the 2003 season with River City. In 2003 he notched a career-high 101 strikeouts in 110.2 innings pitched. He has a career 21-16 record with a 3.97 ERA and 247 strikeouts in 303.2 innings pitch in 82 games. We were all very impressed with Gregs performances at the end of last season. He joined the team very late in the year and pitched extremely well. We feel he is the type of pitcher who can be a strong presence on our team and throughout the league, said Patrick McVerry, President/ General Manager of the Somerset Patriots Baseball Club.